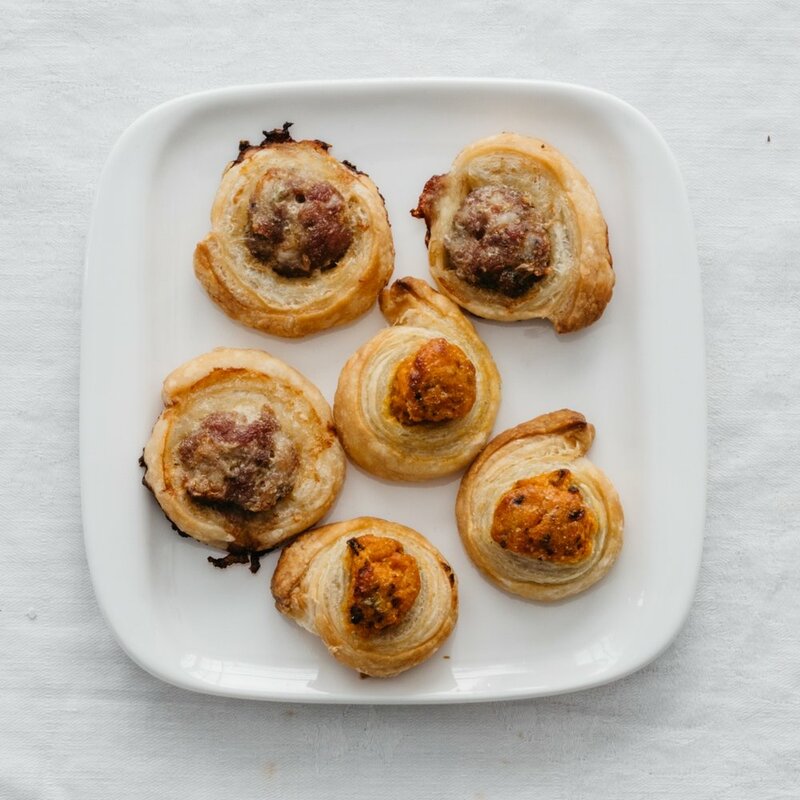 Beloved by kids and adults alike, these little coins are an updated, sophisticated take on the classic Pigs in Blankets. Make them vegetarian with sweet potatoes in place of the sausage, or make a batch of each and serve them together on the same platter. Don’t skip the honey mustard and chutney for dipping. Roll out thawed puff pastry into a 12- by 12-inch square and then divide into 4 equal smaller squares. Prick the sausage skins all over with the tines of a fork. Place a sausage at the bottom edge of each square and roll up in the pastry, brushing the top edge with egg wash to stick. Chill, seam side down, for 30 minutes then slice crosswise into ½-inch coins and arrange cut sides up on a parchment-lined baking tray. Brush with egg and bake at 400°F for 10–15 minutes or until golden, then serve with honey mustard and chutney. To make ahead, freeze sausage rounds until firm, then store frozen in a zip-top bag until ready to bake (they take 15–20 minutes from frozen). For a vegetarian version, mash roasted sweet potato with grated garlic, Parmigiano Reggiano, minced winter herbs and a dash of cream; arrange in a sausage-shaped log at the bottom edge of each puff pastry square, then roll, chill, slice and bake as instructed above. Top with chopped pecans before baking, if you like. This recipe appeared in the Winter 2019 issue as part of a larger story on pantry staple hors d’oeuvres.